Thomas (Tom Hiddleston) and Edith (Mia Wasikowska), the potential couple at the centre of a gothic romance. Guillermo del Toro’s Crimson Peak is a companion piece for his early films The Devil’s Backbone (El espinazo del diablo, Spain-Mexico 2001) and Pan’s Labyrinth (El laberinto del fauno, Spain-Mexico-US 2006) and the film he helped to produce, El orfanato (The Orphanage 2007). But whereas these films combined the ‘gothic romance’ with a Spanish Civil War story via various rich metaphors, del Toro’s new film is essentially a re-working of a classic gothic romance narrative set in the early Edwardian period. Compared to the earlier films Crimson Peak is even more beautifully conceived and designed but unfortunately does not carry the same powerful political message. It does, however, offer a worthwhile commentary on the gothic romance and the presentation of ‘phantasms’. The narrative involves an English ‘gentleman’ and his sister, Thomas and Lucille Sharpe (played by Tom Hiddleston and Jessica Chastain), who visit Buffalo NY where Thomas seeks investment funds from the banker Carter Cushing. Thomas wants to build a mechanical extractor for the deposits of red clay on which his family property sits in the wilds of Cumberland. The blood-red clay is valuable for firing high-quality tiles but is also threatening the foundations of the great old house and seeping through the ground like blood. Thomas and Lucille leave America without investment funds but with Cushing’s daughter Edith (Mia Wasikowska) as the new Mrs Sharpe. They return to the great gothic mansion where the rest of the narrative plays out. Edith begins to explore the gothic house . . .
. . . in which there is often somebody watching – here Jessica Chastain as Lucille. 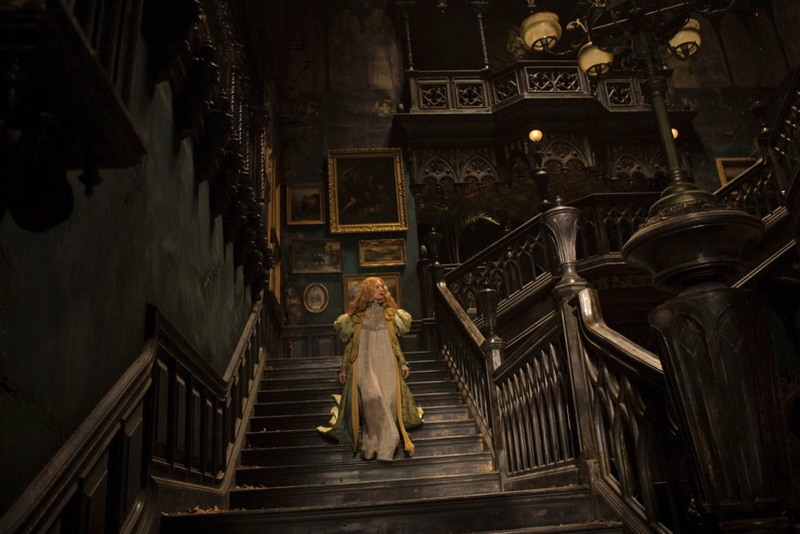 Once in the UK, Crimson Peak becomes more focused on a three-way power struggle in the classic gothic house with strict colour coding of costumes and fantastic attention to mise en scène, lighting and cinematography. The background to the production suggests that del Toro had been trying to make the film for a long time, but that he hung on until he found backers prepared to let him have the $50 million that he knew would be needed to create the spectacle that he wanted to create. This passion for the project is evident in the number of promotional videos that accompanied the film’s release, including one in which del Toro himself takes us through aspects of set design and the SFX needed to create his ‘phantasms’ – creations that are part digital effect and part traditional effects work (see the clip below). I went to see Crimson Peak on a large multiplex screen, primarily to immerse myself in the production design and the richness of del Toro’s imagination. I wasn’t sure what kind of narrative to expect and I’m still not sure why I didn’t enjoy it more. Everything about the production is first class, including the three central performances. Del Toro’s ideas are gloriously realised in the set and I enjoyed the presentation of the phantasms. The film was shot in Canada and the one feature that didn’t work for me was the presentation of landscape. The mystery is why del Toro and his co-writer Matthew Robbins chose ‘Cumberland’ as the location for the house – and then presented it as an isolated house on a featureless snow-covered moor, so that it could really have been anywhere. There is a strong sense of landscape in British gothic stories set in the late 19th and into the 20th century. Think of The Hound of the Baskervilles, Hitchcock’s Rebecca or the more recent The Woman in Black. The landscape doesn’t have to be ‘factually correct’ but it should resonate with the story in some way. I seem to remember that del Toro shot in Northern Ireland on the Devil’s Causeway for Hellboy 2, so he has had some experience of the possibilities. Perhaps I’m just complaining because I want to see Cumbrian landscapes – I don’t worry about the Spanish locations in the earlier films, but that’s because they do seem to be part of the overall presentation of the Civil War. Crimson Peak didn’t find the large audience that might have justified its production spend. I think that’s partly because gothic melodrama/romance is currently out of favour and is only acceptable as part of a package in which the potential horror story is strong enough on its own. By mixing the two in the way it is done here – appealing to two different audiences – del Toro has not really satisfied either. I suspect that the focus on the production design has meant that the script received less attention than it should have done. Thinking back, the ingredients are there for a great melodrama – there are narrative elements about childhood and parenting that might have come from a Wilkie Collins novel – but somehow they don’t cohere. Perhaps Crimson Peak will become a cult film through theatrical revivals – I’m glad I saw it on a big screen. Guillermo del Toro’s Spanish-set films are discussed in Chapter 4 of The Global Film Book.